While the words "construction daily report" may seem self-explanatory, they really don't do justice as to just how important a document such reports can be. In addition to serving as a record on the progress of a project, these reports can serve as time sheets, safety alert systems, supply trackers, and so much more. But in order to be a useful document, not only do these reports have to subscribe to a certain format, they should contain certain features as well. Use Software For Mobile DevicesNot all that long ago, construction daily reports were filled out in longhand using a construction daily report template and then transcribed (often in a location away from the work site) using a typewriter or computer. In addition to data being lost or misinterpreted when shifted from location to location, deadlines in filing this information occurred as well. But with technology like Raken's software for construction daily reporting, these reports can be filled out in the field on devices like phones and tablets. In addition to the convenience for field staff, Raken's report forms are properly formatted to insure compliance. In addition to being filled out, Raken's reports can also be transmitted and viewed by various parties via these devices. Keep Track Of Time WorkedThe amount of man hours being spent on a project can be indicated within the content of a construction daily report. Raken's software insures that such data is correctly formatted, which can make it suitable for formal examination. This format also allows this construction tracking software feature to serve as a alternative field timesheet if desired. 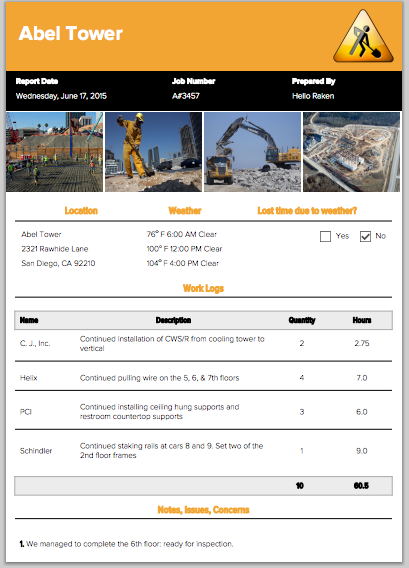 Include Photographs And Graphics With Reports"A photo is worth a thousand words", and with technology like Raken's it's now very easy to incorporate digital photographs and graphics seamlessly within the body of a construction daily report. As to the content of these non-textual facets of the report, they can vary daily. Photographers would be wise to include any changing events here such as new equipment arrival and use, significant project change, safety hazards, and illegal dumping. Include Survey InformationReports should include direct observations and information from field staff when feasible. While it is not possible to include full reports from all employees, important data can be conveyed within official reports as responses to survey questions. Raken's reporting format allows this information to be completed quickly and correctly by field employees using devices. The information can then be incorporated digitally into the larger report. Include Observations In FullBecause construction daily reports serve as a official record and can be introduced as a legal document in court, all observations should be as detailed as possible. Avoid abbreviations and acronyms. Address mentioned employees within the report by full names. Any photographs or graphics should be clear and easy to view. This format should be followed regardless of the report's subject. And Raken's software makes it easy to submit and store detailed construction daily reports, which can be found and easily edited. Raken's cloud technology also means that files can be stored for up to ten years, making these reports permanent records. Want more? Check out our example daily report.